Here are some perfect one year anniversary gifts for your first wedding anniversary. Choose from a wide range of traditional paper anniversary gifts, or the modern gift of clocks. The honeymoon is over and you’ve had eleven months of wedded bliss. Now you’re rapidly approaching your first anniversary and you need to find the perfect gift for each other. Love Letters: Either pen a new love letter to your partner describing how much you’ve enjoyed your first year of married life. Or, dig up some of your old letters that you sent to, or received from, your partner, and put them into a binder, or photo album. Add your favourite photos from your courtship and you’ll have the perfect romantic gift. Paper Flowers: Flowers are always a big hit on an anniversary, so what can be better than flowers that never fade! JustPaperRoses have taken the classic bunch of roses to a whole new level. Starting with "Paper Roses" for the 1st anniversary, they have developed a bunch of roses for each anniversary made out of the traditional material for that year, e.g. cotton for the 2nd anniversary, leather for the 3rd, etc. 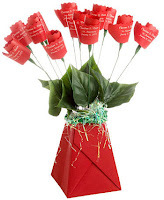 To get your Paper Roses for your first wedding anniversary gift and to see other novel one year anniversary gifts, visit JustPaperRoses today! Coupons: Write your own coupons for free housework for a week, kisses, washing the dishes, back rubs, etc. Or, for a very romantic evening, give a coupon for movie night and watch your wedding video! Framed marriage certificate: Make a copy of your marriage certificate and frame it. Look for a ‘wedding anniversary’-themed frame, or get a sliver-plated frame and have it engraved with a personal, romantic message. Jigsaw Puzzles: Find a picture that you both like or, better still, get a custom puzzle made from one of your own wedding or honeymoon photos. Card and Board Games: Favourite games for two include backgammon, cribbage and chess. Or take a look at some racier games in the Amazon carousel below (click each image for more details and lowest prices). Photographs: Enlarge and frame photos of your favourite memories, romantic getaways and good times. Posters: Choose from favourite topics such as fine art, animals, movies or have one of your own photos made into a poster! Paintings: Splash out and start a collection of your favourite artists. Get a new print every year and before you know it, you will have built a significant art collection. Banknotes: Most people don’t like to give money as a gift but consider framing a bill from your honeymoon destination, or other memorable romantic getaway. Stock certificates: Investments in companies that might be meaningful to your partner. Gift certificates: Unlimited opportunities to find gift certificates for life experiences that you can share, including spa days, golf, romantic getaways, dinner at a local restaurant and much more. Magazine Subscriptions: Favourite hobbies or pastimes – hunting, fishing, cars, dress making, cooking, running, cycling, interior design, the list is limitless. Sheet music: If either of you are musicians, then sheet music for any song that has special meaning in your life would make a thoughtful and romantic one year anniversary gift. Movies / theatre / concert: Everyone loves a night out, especially if it gives you both a chance to see that new show that everyone is talking about. Lottery tickets: Buy an annual subscription for yourselves to the lottery and live with the dream of becoming a millionaire each and every week of the year! Sports events: Score some tickets to your favourite sports team: football, basketball, hockey, golf, soccer - the list is endless. Support your local teams or combine with travel to an away game and enjoy a romantic getaway. At Last, The Perfect (Paper) Anniversary Gift! Now you can get the perfect first wedding anniversary gift for yourself and your friends. How would you like to give the gift that keeps on giving - year after year? Our Wedding Anniversary Memory Book allows you to record those special moments in your life - with photos and hand-written memories. Moments that you can share with your partner, or your children, for years to come. I was delightfully impressed with how beautiful this memory book is. It has slots for photos and prompts to help one remember the important events in life! I have given the Wedding Anniversary Memory Book to several brides-to-be and it is always an "ahh" moment! I actually bought this for myself first and fell in love with the idea! Great album, easy to write, and keep those memories alive! Order your Memory Book from Amazon now while quantities last! If you’re still looking for that perfect gift, then you could consider these romantic anniversary gifts to share or a romantic getaway for a long weekend, or longer, depending on your budget. Here are more ideas for One Year Anniversary Gifts. For other great anniversary gift ideas, check out Anniversary gifts for her and Anniversary gifts for him. I hope this article on One Year Anniversary Gifts has helped you to find that perfect first wedding anniversary gift!